With Old School New Rules, Hank Wiliams Jr. wasted no time sharing his opinion about ESPN’s decision to dump his Emmy-winning song as the opening theme for Monday Night Football. The tune’s rocking, rollicking sound is based on his father’s (Hank Williams Sr., of course) song, Mind Your Own Business. It's also a reference to Williams’ now infamous 2011 interview on Fox & Friends in which an allegory intended to get a point across was deemed by some to be a comparison between President Obama and Adolf Hitler. The brouhaha that inspired the album Old School New Rules. If anything good came out of the brouhaha, it was that Williams became inspired to write and record his first new album in three years. The aptly titled Old School New Rules contains 11 tracks, including a cover of his dad’s You Win Again but with a Southern rock twist. Williams tackles a number of relevant subjects, including what he calls “America haters’ on his pro-troops We Don’t Apologize For America; Wall Street thieves and swindlers on Stock Market Blues; and Who’s Takin’ Care of Number One, which laments government policies and the way working men and women are getting the shaft. The radio and CMT-friendly That Ain’t Good is the first single off the album, and a good choice at that. The bluesy, straightforward song takes aim at the media. “Watching these nuts on TV/Blowing themselves to hell/So they can all get to heaven and my kids want me to tell/Tell ‘em why/Did all those people have to die/No that ain’t good,” he sings. Even at the age of 63, Williams’ strong, robust voice conveys the power of his emotions. He sounds just as good as he did 30 years ago. He also delves into his storied past on Old School, where he gives props to the musicians who were part of his musical upbringing as a child. These include people like Johnny Cash, Jerry Lee Lewis, and Earl Scruggs. But not everything is sentimental. Cow Turd Blues showcases the singer’s sense of humor and ear for a great melody. There’s not a weak song on the album, but I think I’ll Just Stay Here And Drink is a true gem. With Williams and the legendary Merle Haggard trading lines and messing around, it has the mark of a classic romp as the two musicians have a good time. Williams does the same with Brad Paisley on I’m Gonna Get Drunk And Play Hank Williams. There is no doubt his storied life and history have shaped Williams' writing and career. He was born in 1949 and lost his dad in 1953. Left to be raised by his mother Audrey, Hank Jr. quickly developed a penchant for music, singing and playing his dad’s songs. Audrey took it a step further by having clothes made for Hank Jr. that were just like his dad's. By the mid 1970s, Williams had broken away from the image and ended his mother’s involvement with his career. Since, Williams has recorded more than 70 albums and has sales of 55 million records to his credit. Some of his songs, including Rowdy Friends, Old Habits, and Whiskey Bent and Hell Bound helped to define the country sound of his time. Old School New Rules Swaggers In With 8.7 On The Liquid Hip Richter Scale. Released on his own Bocephus Records under a licensing agreement with Blaster Records, Old School New Rules is a fine showcase for Williams’ fiery voice and blend of traditional country, Southern rock and blues, and adds a new dimension and potential new audience for the country music legend. You can find Old School New Rules by Hank Williams Jr. on iTunes. The CD is available at Barnes & Noble and the album is available on Amazon. Williams has shows set for late July and August in Wyoming, Oklahoma, Iowa, Kentucky. 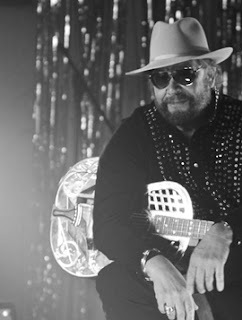 Keep up with Hank Jr. on Facebook. Daniel H. Wilson Gets Amped. You?